So today it was 65 degrees! It felt like summer!!! I think Spring may be around the corner. Although it is supposed to be 32 again tonight. My kids were so excited to be outside playing yesterday and today. At the end of summer Karli had begged for her training wheels to be off, we knew she was not ready but you can't argue with a almost 5 yr old. She never touched the bike after that day. 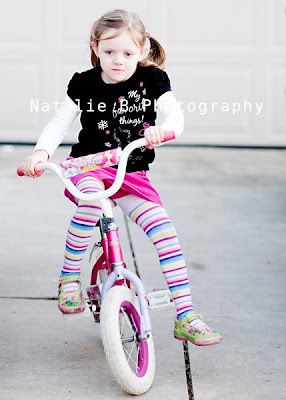 So yesterday she got out her bike, and had daddy help a few times. 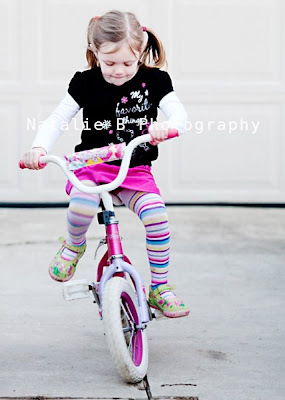 Then today she begged us to hold the back and we just showed her how to use one foot, then the next on the peddles. She has a little temper and was not easy to work with so we left her alone. All day long she tried and tried while the boys played basketball. Finally about 5pm she ran in the house and told me to come watch her. To my surprise she was riding her bike!! It was so exciting to watch her. She is 5 1/2 years old, much younger then I was when I learned to ride. Our son Kade taught himself at 3 yrs old but Kyle was about Karli's age too. So here are some snapshots of her, I actually ran in the house to capture this moment as I did with the boys. 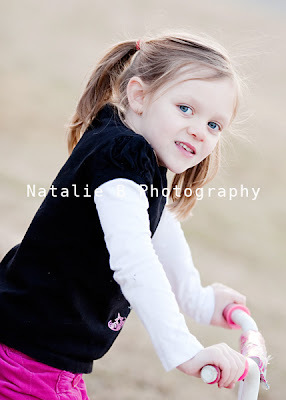 I ran across your blog and passed your name onto a friend who is looking for a photographer in Michigan. I'm a photographer in Indiana ... (once a michigander myself ;o) Just wanted to let you know in case she contacts you and mentions me! beautiful work!